Are you one of the many people who don’t drink enough water every day? 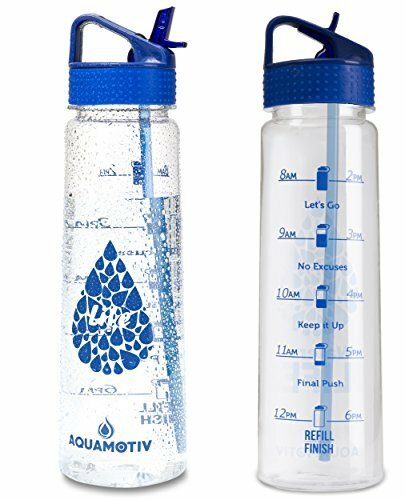 Have you ever considered looking for something that can help you keep track of your water intake? How can a water bottle with drinking schedule help you? In this article, you’ll be able to find the right water bottle to help you pay attention to how much water you’re drinking on a regular basis. These water bottles are designed with words printed on the side to tell you what time of the day you need to drink more water. The time in which you are awake is divided into increments, and in each of these increments you are meant to drink 6 or 8 ounces of water, depending on how large the bottle is. The more you do this, the better you’ll get the hang of it. 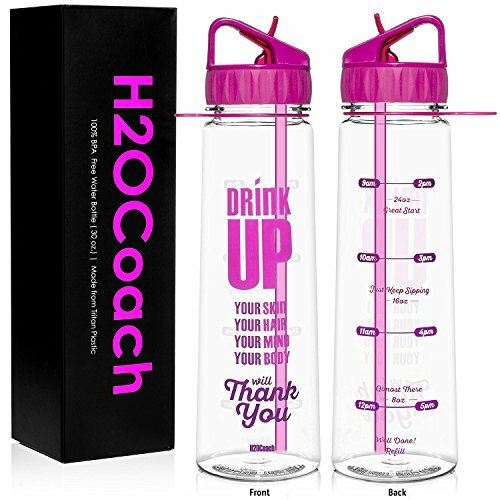 These types of water bottles are meant to encourage you to drink the right amount of water every day and to get into the habit of doing so whether you have your bottle with you or not. Last update on 2019-04-23 at 17:05 Product prices and availability are accurate as of the date/time indicated and are subject to change. Any price and availability information displayed on [relevant Amazon Site(s), as applicable] at the time of purchase will apply to the purchase of this product. Remind yourself to keep up with drinking your water throughout the day with this Drinkable Time 30 Oz Hydration Water Bottle. This handy bottle features a purple lid, purple print on the sides, and a purple straw, which makes it easy to find and identify as yours whether you’re at the office or the gym. It also comes in a matching blue variety if you prefer that option instead. This bottle is designed to cut back on the buildup of bottle sweat, making it easier to hold on to when you’re active and keeping it cleaner for longer, too. This is a dishwasher safe bottle that can be put on the top rack with no trouble. Some customers find that the included straw is hard to drink out of or becomes grimy easily without regular daily washing. Some customers have trouble reading the smaller print on the side of this bottle in comparison to the others listed here. 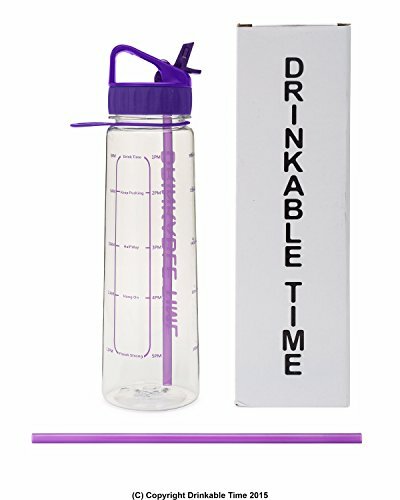 This 30 oz Flip Straw Inspirational Fitness Water Bottle is here to remind you that “water is life!” Keep track of how you’re doing throughout the day with an encouraging time schedule that reminds you to “keep it up” and “chug-a-lug” depending on which point you’re at throughout your day. This clear water bottle features a blue lid and blue print that makes it easy to read even when you’re on the go. For those who are interested in doing some good globally, 10% of the proceeds from this water bottle are donated to projects for clean water in Africa. This water bottle is designed to fit into just about any cup holder so you can easily keep it with you when you’re on the go. Some buyers have reported having issues with this water bottle leaking from the lid even when shut properly. If you put this water bottle in the dishwasher, there’s a chance the writing on the outside will come off. 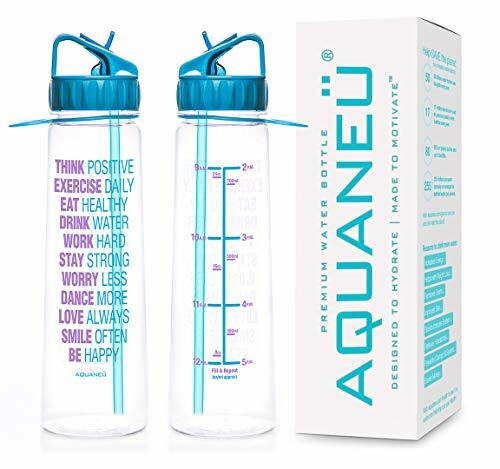 This compact and portable Aquaneu 30oz Inspirational Fitness Workout Sports Water Bottle is ready to help you stay focused and drink all the water you in need in a day without losing sight of why you’re doing it. One side of the bottle is printed with a phrase to keep you going strong: “Think positive, exercise daily, eat healthy, drink water, work hard, stay strong, worry less, dance more, love always, smile often, be happy.” The other side features time markers to tell you how much water to drink at which point throughout the day. This is one of the best-selling time schedule water bottles on the market today and continues to be a top choice for many customers. This bottle comes in four color options, which is more than the others listed here offer. The straw included with this bottle is narrow and may be difficult to get the water to come out of. Some customers have noticed that this bottle causes the water to taste like plastic no matter how many times they wash it. This bottle is very lightweight and easy to keep on hand whether you’re in the office or on the go. For those who are trying to drink more room temperature water for health reasons, this bottle is ideal in that it doesn’t let the water get too hot or too cold. Many customers have reported the straw on this bottle dripping badly when they try to drink out of it. Some customers have also reported the straw making a lot of noise when they use it. 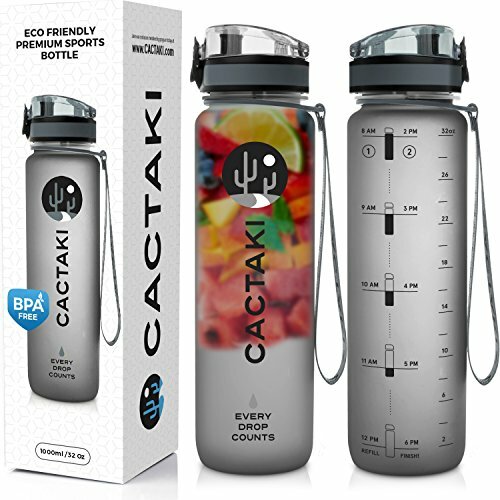 Choose the Cactaki Water Bottle with Time Marker when you’re looking for a durable and sturdy bottle that won’t leave you guessing whether you’ve had enough to drink yet or not. This bottle is available in either a gray body with a black cap or a white body with a blue cap, and they both come with the same time markers on the sides. Bring this handy bottle along with you throughout your day and you’ll never have to worry about keeping track of your water intake again! This is another best-selling water bottle that many customers have been pleased with. This bottle can be easily opened with one hand, making it perfect for working you. This is the most expensive option on our list and may cost more than some customers feel is fair for a product like this. This bottle can’t be used well in the dishwasher, even on the top rack, because it may fade or turn yellow. As you can see, these water bottles can be very helpful when you’re trying to learn to drink more water. But are these bottles also effective at discouraging people from drinking too much water? Absolutely! By keeping one of these bottles handy, you’ll know how much to drink without going over or under the right amount of water for your daily intake. You’ll feel great in no time!